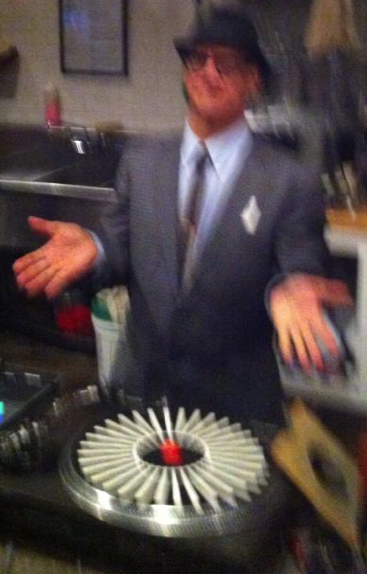 Phast Phreddie the Boogaloo Omnibus is New York City’s bossest DJ!! Phast Phreddie the Boogaloo Omnibus is a club disc jockey who specializes in Modernist Vintage Astro Sounds: Soul Musc (he is resident DJ for Subway Soul Club), Go-Go, garage and mod (he has guested at Smashed! Blocked! and The New Untouchables), lounge, exotica (he has guested at Tiki Oasis and The Hukilau), surf, twist, R&B, organ grooves, ska, Doo Wop, jerk, rockabilly and other assorted madness–anything can happen at The Wang Dang Doodle, which he hosts. The Automatic Boogaloo Generator will instantly send a reply. In a previous existence, Phast Phreddie was the editor and founder of BACK DOOR MAN magazine, an early example of Rock’n’Roll fanzines, that existed from 1975 to 1978. During the late seventies, Phast was on the Hollywood punk rock scene and wrote for Slash Magazine, briefly managed The Zeros and was resident DJ at several popular nightclubs, including Madame Wong’s West, the Starwood and the Cathay de Grande. During the eighties, he led his own band, Phast Phreddie & Thee Precisions, held a DJ residency at the Club Lingerie in Hollywood, worked for the Rhino Record Store and was tour manager for Peter Case and Redd Kross. He also led a poetry-with-a-beat group called Phast ‘n’ Bulbous and was a member of the psychedelic rock and soul group The Love Supremes. Since moving to Brooklyn in 1992, Phast has been a writer, a music publisher, an archivist (he works at The ARChive of Contemporary Music) and has renewed his club DJ activities with a passion–specializing in music from the Sixties. This Boogaloo Bag is here to promote Phast Phreddie’s DJ activities and to discuss several other concerns he may have–mostly dealing with all sorts of reet music and swingin’ records. If you do the Facebook thang, dig The Boog HERE!!!! The Boog focuses on the Groove! Phreddie…its Terry Rae..How you doing? Did you hear about the Hollywood Stars new vinyl release from 1974 ? Its called ” Shine like a radio ” . Check it out if you get a chance. Hope all is well with you.